As we leave the red planet and its moons behind us, we next encounter a strange collection of small planet-like objects. 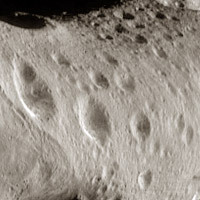 This is the asteroid belt. 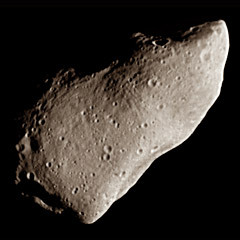 These asteroids, also known as planetoids, range in size from several hundred miles to several hundred feet. At least 30,000 of these giant rocks are known to be floating in their own individual orbits between Mars and Jupiter. Scientists are not sure why there are asteroids here instead of a planet. Some believe that a large, rocky planet may have existed here in the past. This planet may have then been blasted to pieces by a cataclysmic impact. 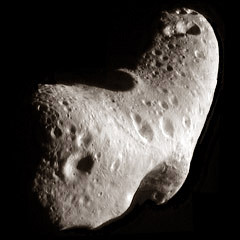 Others think that the asteroids are composed of the leftover material from which the Solar System was originally formed. The largest of these asteroids, Ceres, is over 630 miles in diameter. It was discovered by Giuseppe Piazzi in 1801. Not all asteroids are confined to the asteroid belt. There are several hundred known asteroids that regularly cross the orbit of the Earth. They are known as Earth-crossing asteroids. They range in size from several miles to the size of a small pebble. Sometimes these objects get close enough to the Earth that they are pulled in by its gravity. Outside the Earth's atmosphere, these objects are known as meteroids. They can enter the atmosphere at speeds of up to 45,000 miles per hour. Once a meteroid enters the atmosphere, it is known as a meteor. Most meteors burn up in the atmosphere before they can reach the ground. The bright, glowing streak they leave in the sky is cause by hot ionized gases formed from the heat of friction. Occasionally, a large meteor will survive its trip through the atmosphere to reach the ground. A meteor that has fallen to the ground is called a meteorite. Meteorites can be found in most parts of the world, and are generally composed of stone, iron, or a combination of the two. Several times during the year, hundreds of meteors can be seen in a single night. This event is known as a meteor shower and happens when the Earth passes through the debris left behind by a comet. Most of this debris is the size of dust or sand. Some particles can be a little larger, about the size of a small pebble. These larger particles can cause extremely bright meteors known as fireballs. The Earth-crossing asteroids present some reason for concern. 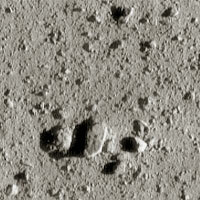 Several hundred of these have been discovered with a diameter of over a mile. 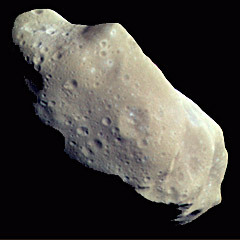 At the extremely high speed with which these objects travel, even small asteroids can cause a great deal of damage. Barringer Crater in Arizona is nearly a mile across and was formed by a meteor only 150 feet in diameter. Most scientists believe that the dinosaurs were killed when a asteroid about 10 miles in diameter plowed into the Earth. 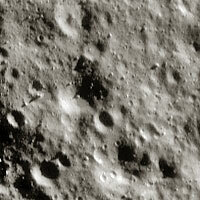 This impact left a crater nearly 200 miles in diameter. Millions of tons of dust and dirt would have been thrown into the atmosphere, cutting off the light from the Sun. With no sunlight, the plants would die. With no food, the animals would also die off. Scientists believe that several mass extinctions like this may have taken place throughout the Earth's long history. It is believed that there are several hundred Earth-crossing asteroids yet to be discovered. Both professional and amateur astronomers are combing the skies to try to find these elusive objects. Is Earth in danger? The answer is yes. Our planet has been hit by asteroids in the past and it will most definitely be hit again in the future. But don't worry too much. The odds of an event like this happening in our lifetime are a million to one. And chances are that if an asteroid were discovered to be on a collision course with Earth, we would be able to use our technology to stop it. Movies like Deep Impact and Armageddon may not be too far fetched in the not-too-distant future.